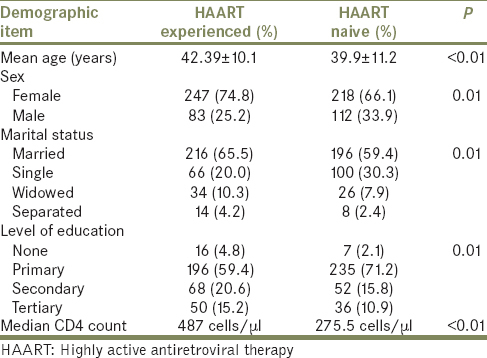 Introduction: Highly active antiretroviral therapy (HAART) reduces morbidity, mortality and prolong life in patients with human immunodeficiency virus (HIV) infection. Only a few studies have compared the prevalence and pattern of inflammatory dermatoses and skin cancers in HAART-naïve and HAART-experienced HIV-infected patients. Aim: The aim of this study was to determine the prevalence and pattern of inflammatory dermatoses and skin cancers in HAART-experienced and HAART-naive patients in the University of Benin Teaching Hospital, Benin City, Nigeria. Methods: This was a comparative cross-sectional study that involved 330 HAART-experienced patients and 330 HAART-naive patients. Patients were examined for inflammatory dermatoses and skin cancers. Skin biopsies were done where applicable for diagnostic accuracy. Results: The mean age of the HAART-experienced group and HAART-naïve group was 42.39 ± 10.1 years and 39.9 ± 11.2 years, respectively. The male-to-female ratio of the HAART-naive and HAART-experienced population was 1.9:1 and 3:1, respectively. The median CD4 count of the HAART-naive group was significantly lower than the HAART-experienced group (275.5 vs. 487 cells/μ P ≤ 0.01). Skin cancers were present in 1.8% of the HAART-naïve group but absent in HAART-experienced patients (P ≤ 0.01). The prevalence of inflammatory dermatoses was 36 (10.9%) in the HAART-naïve group and 8 (2.4%) in the HAART-experienced group (P < 0.01). Pruritic papular eruption was the most common inflammatory dermatoses in both groups with a prevalence of 7.6% and 1.2% in the HAART-naïve and HAART-experienced groups, respectively. Conclusion: Inflammatory dermatoses and skin malignancies were more common in HAART-naive HIV-infected patients compared to HAART-experienced patients. HAART may reduce the cutaneous morbidity in HIV patients. The skin is an exceptionally vulnerable organ; hence, cutaneous manifestations often herald some systemic illness. This is particularly true for those who are infected with human immunodeficiency virus (HIV). Cutaneous manifestations of HIV include skin infections, inflammatory dermatoses, medication reactions and skin cancers. Skin diseases in HIV patients are common because antigen presentation, cellular immunity and killer cell ability are significantly impaired due to the destruction of CD4 cells in the skin. This ultimately predisposes the HIV-infected patient to various skin diseases. Inflammatory dermatoses and skin cancers are a subset of cutaneous disorders seen in HIV patients. Cutaneous inflammatory dermatoses and skin neoplasia are common in the setting of HIV infection. Some studies have reported a prevalence of inflammatory dermatoses of between 5% and 10% and about 6% for skin cancers. Some of these conditions may be life-threatening and are clues to critical immunosuppression. Less severe disease may affect the quality of life, as visible disease may have a negative impact on self-confidence. Highly active antiretroviral therapy (HAART), a combination of antiretroviral drugs that act at various steps in the viral replication have been shown to dramatically decrease the incidence of cutaneous morbidities such as inflammatory dermatoses, skin cancers and cutaneous infections. In addition, it has been shown to delay progression of the disease and prolong life. 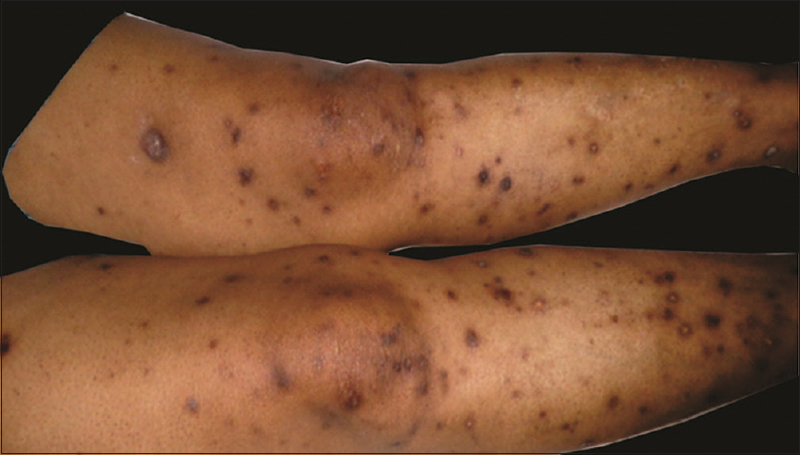 A variety of inflammatory skin conditions have been described in HIV-infected patients since the advent of the disease and they commonly include pruritic papular eruptions, seborrheic dermatitis, atopic dermatitis, psoriasis, eosinophilic folliculitis, xerosis, ichthyosis, reactive arthritis and prurigo nodularis. Less common manifestations of inflammatory dermatoses include persistent pityriasis rosea, erythroderma, pityriasis rubra pilaris, lichen planus, granuloma annulare, urticaria, vasculitis and morphea. Previous studies have reported the prevalence of inflammatory skin disorders and cancer in HIV patients.,,, However, only few studies from sub-Saharan have compared the prevalence and types of inflammatory skin disorders and skin cancers in HAART-naïve and HAART-experienced patients. This study compared the prevalence and patterns of inflammatory dermatoses and cutaneous cancers in HAART-naïve and HAART-experienced patients. The study was carried out in the University of Benin Teaching Hospital in Benin City, Edo State, the South-South geopolitical region in Nigeria. It is located at ward 10 Egor local government area, Benin City, Edo State. This comparative cross-sectional study was utilised. The duration of the study was from the 10th August to 10th November, 2013. They included 330 HIV-positive patients who are on HAART for at least 6 months and 330 HIV-positive patients who were HAART naïve. All consenting HIV-positive patients above 18 years of age that attended the HIV clinic on HAART for at least 6 months were included in the study. All patients with prior skin disorders before the diagnosis of HIV was made. All consenting HIV-positive patients above 18 years of age that attended the HIV clinic, not on HAART were included in the study. The minimum sample size for this study was calculated using the sample size formula, for two independent sample size proportions. P1 = Prevalence in population 1 = 53% (prevalence of cutaneous morbidity in patients on HAART). P2 = Prevalence in population 2 = 66% (for prevalence of cutaneous morbidity in patients not on HAART). For this study, a sample size of 330 for each of the population groups was used. Permission was gotten from all patients in whom this study was done, after explaining to them the purpose of the research, procedures involved, risks and benefits of the research. In addition, information received was treated with utmost confidentiality. Furthermore, intellectual property rights were respected and plagiarism avoided. The approval was gotten from the ethical committee to ensure there was no violation of the above considerations. A systematic random sampling technique was utilised. The sampling interval was calculated. An initial work through the survey was done. The HIV clinic was noted to run 4 days weekly excluding Wednesday. Approximately 150 HIV-infected patients were seen on each clinic day. Of these, about 120 patients were on HAART. Among those patients, 90 of them had been on HAART for 6 months and above. About 30 patients were yet to commence HAART (i.e., being worked up, yet to fulfill treatment criteria, etc.). On the average, 1440 patients who were on HAART for 6 months and above were seen monthly whereas about 480 patients who were not on HAART were seen monthly. On each consulting day, HIV-positive patients who had been on HAART for 6 months and above were selected from the list of patients expected for that day. The first patient was selected based on the balloting technique, and successive patients were selected after the 13th person. If the patient selected did not meet the inclusion criteria, reballoting was done. Furthermore, if the patient had been previously selected, reballoting was done. where N = total number of HIV-positive patients not on HAART seen over a 3 months' period. On each consulting day, HIV-positive patients were selected from the list of patients expected for that day. The first patient was selected based on the balloting technique, and successive patients were selected after the 9th person. If the patient selected did not meet the inclusion criteria, reballoting was done. Furthermore, if the patient had been previously selected, reballoting was done. This involved the examination of the skin using surface microscopy (epiluminoscopy). It was useful in evaluating pigmented skin lesions such as acral lentiginous melanoma (parallel ridge pattern) and nonpigmented inflammatory skin lesions such as psoriasis (dotted vessels with scaly surface). Furthermore, it was useful in the diagnosis of Kaposi's sarcoma (rainbow pattern). Partec flow cytometry was used for analysing CD4 count. The first step in the measurement of cells was staining with a fluorescent dye. The fluorescent molecules are taken up by the cells. The cells are individually illuminated by light of a defined wavelength. The light activates the fluorescent molecules so that they emit the light of a characteristic colour wavelength. This fluorescent light is filtered out and its intensity is measured by ploidy analyser for each single cell. The fluorescent light intensity emitted was proportional to its CD4 content. For cell counting, the sample volume detector measures exactly 0.2 ml of the sample volume. Each fluorescent cell in this volume was counted from which the ploidy analyser determined the concentration or number of cells per ml. Skin biopsy involved a process whereby skin tissue was taken for the purpose of histological diagnosis. This procedure was used to confirm clinical diagnosis where applicable. There were different methods of skin biopsy techniques used in the course of the study, and they included in the study. This method involved sterilising the skin with alcohol swab and then subsequent anaesthesia with lignocaine. A sterile biopsy punch was used to remove a cylindrical core of skin and all layers of skin including subcutaneous fat. Once the skin was cored, a scalpel blade was used to excise cored skin. Shave biopsy was used for lesions affecting top layer of the skin (dermis and epidermis). A superficial slice of the skin was taken using a scalpel blade. No stitches were required as it usually healed within 1–2 weeks. This was used where a larger piece of the skin was required to make a diagnosis. A scalpel blade was used after the skin had been cleaned and anaesthetised. Stitches were then subsequently applied to secure hemostasis. This involved the removal of the entire skin lesion with a wide margin. It was done for suspected skin malignancies such as squamous cell carcinoma, basal cell carcinoma, etc. Stitches were usually required to secure hemostasis. A standardised interviewer administered questionnaire was administered to clients to obtain demographic characteristics such as gender, age and marital status. In addition, relevant clinical information such as commencement of HAART, duration of HAART therapy, adherence to HAART and presence of skin problems were also assessed. A full clinical examination was carried out on each patient. The diagnosis was made on clinical ground. Dermatological tools, such as dermoscopy, were used to boost diagnostic accuracy. The skin biopsy was done for the confirmation of clinical diagnosis where applicable, for example, in patients with suspected skin neoplasia. Clinical pictures were taken of several skin lesions seen. All data generated was collated, checked and analysed using a computer-based Statistical Package for Social Sciences IBM version 21.0 (IBM Corp., Armonk, NY). Percentages and proportions were used to describe categorical variables whereas means and standard deviation were used to summarise data. The prevalence of inflammatory dermatoses and skin cancers in each study population was analysed by calculating the number of patients with skin disease relative to all patients participating in the study. These types of inflammatory dermatoses and cutaneous neoplasia was seen in each study population were represented in frequency tables and charts. The prevalence and types of inflammatory dermatoses and cutaneous cancers were compared in both study population using Chi-square test (P < 0.05 was considered statistically significant). The Chi-square test with Yates correction was used for comparisons with small subgroup size of 5 or less. The median was used to present skewed data (CD4 counts), and the Mann–Whitney U test was used as a test of hypothesis. The mean age in the two groups was compared using t-test for two independent sample population groups. There were two study population groups, the HAART-experienced group and HAART-naive group. The HAART-naive population was 330 (218 females and 112 males) with a female-to-male ratio of 1.9:1. The HAART-experienced population was 330 (247 females and 83 males) with a female-to-male ratio of 3:1. Most of these patients had primary level of education, 196 (59.4%) for the HAART-experienced group and 235 (71.2%) for the HAART-naive group. Those who had no level of education were the least observed in both groups. The mean age for the HAART-experienced group was 42.39 ± 10.1 years with an age range of 18–79 years whereas the mean age for the HAART-naive group was 39.9 ± 11.2 years with an age range of 18–75 years (P < 0.01) [Table 1]. The HAART-experienced group had 315 (95.5%) of its respondents on the first-line HAART and 15 (4.5%) on the second-line HAART. Among the HAART-naive patients, there were 291 (88.2%) new patients who were being worked up, 38 (11.5%) were yet to fulfil treatment criteria (patients who were having regular follow-up visits and had CD4 counts >350 cells/mm3) and 1 (0.3%) who refused treatment on religious grounds despite fulfilment of treatment criteria. A total of 36 (10.9%) inflammatory dermatoses were observed in the HAART-naïve group while the prevalence was 8 (2.4%) in the HAART-experienced group. The difference was statistically significant (P < 0.01). The most common inflammatory dermatoses in both study groups were pruritic papular eruptions with a prevalence of 25 (7.6%) and 4 (1.2%) for the HAART-naïve and HAART-experienced groups, respectively (P < 0.01). The other less commonly observed inflammatory dermatoses in the HAART-naïve group were ichthyosis 3 (0.9%), seborrheic dermatitis 2 (0.6%), psoriasis 2 (0.6%), xerosis 1 (0.3%), urticaria 1 (0.3%), nodular prurigo 1 (0.3%) and atopic dermatitis 1 (0.3%). The less commonly observed inflammatory dermatoses for the HAART-experienced group were xerosis 3 (0.9%) and allergic contact dermatitis 1 (0.3%) [Table 2]. The median CD4 count for the HAART-naive population was 275.5 cells/μl while for the HAART-experienced population, it was 487 cells/μl. The difference was statistically significant (P < 0.01) [Figure 1]. A total of six cutaneous skin cancers were observed during the study. All skin cancers occurred in the HAART-naïve group 6 (1.8%) while there was zero prevalence in the HAART-experienced population [Figure 2]. The most common skin cancer observed was Kaposi's sarcoma occurring in four (1.2%) of the HAART-naïve population. The other two skin cancers observed were squamous cell carcinoma and acral lentiginous melanoma. Inflammatory dermatoses were observed in 36 (10.9%) of the HAART-naïve group and 8 (2.4%) of the HAART-experienced group. The difference was statistically significant. This was also comparable to the Italian series where inflammatory dermatoses were more in the naive (25%) than experienced group (21%). Similarly, this Italian study by Calista et al. like ours did not consider treatment success status of their HAART-experienced patients. It is a possibility, therefore, that considering that may have further reduced the prevalence of inflammatory dermatoses in the HAART-experienced population observed in both studies. This is explainable because the T-helper (TH) cells are seriously affected by HIV infection whereby normal Th-1-mediated immune response is converted to Th-2-mediated response resulting in a variety of inflammatory skin diseases. Pruritic papular eruption was the most common inflammatory dermatoses found in the HAART-naïve 25 (7.6%) and HAART-experienced 4 (1.2%) groups. The explanation for the high prevalence observed in this study may be due the fact that Nigeria still deals with high burden of mosquitoes, especially the female anopheles mosquito, which is believed to be a major aetiological factor in pruritic papular eruptions as it results from hypersensitivity to arthropod bites especially mosquitoes., The high prevalence of pruritic papular eruption is comparable to reports from previous studies,,, where pruritic papular eruptions were found to be very common in patients with HIV infections. These studies, however, did not look at the effect of HAART on the prevalence of these inflammatory dermatoses. Cutaneous cancers were observed only in the HAART-naïve population with a prevalence of 6 (1.8%). There was zero prevalence of cutaneous neoplasm in the HAART-experienced group. The most common skin cancer observed was Kaposi's sarcoma occurring in four (1.2%) of the HAART-naïve population. This finding is in concordance with existing published literature where a collaboration of cohort studies showed that HAART was protective against cutaneous malignancy and other AIDS-defining illness., The skin cancers observed included Kaposi's sarcoma (1.2%), acral lentiginous melanoma (0.3%) and squamous cell carcinoma (0.3%). The prevalence rate for Kaposi's sarcoma was comparable to the reports from previous studies where the prevalence of Kaposi's sarcoma ranged between 0.84% and 5%.,, The incidence was lower in studies done outside of Africa where the prevalence rates ranged between 0% and 1.1%., The higher incidence of human herpesvirus type 8 in Africans,, the primary aetiological factor implicated in Kaposi's sarcoma, may have accounted for the difference. In a study done by Knowles and Cesarman, Kaposi's sarcoma-associated herpesvirus (KSHV) was detectable in more than 90% of AIDS-epidemic KS lesions. In situ polymerase chain reaction studies also demonstrated KSHV in the spindle cells and endothelial cells of KS lesions. KSHV appears to be a transmissible B-lymphotropic herpesvirus. It is detectable in circulating B cells in some HIV-infected patients, and this finding appears to predict the future development of KS among these individuals. 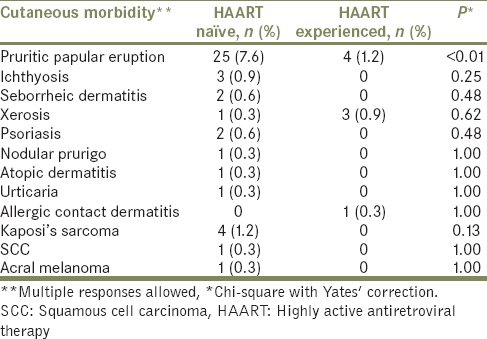 HAART seemed to have significantly impacted on the prevalence of skin cancers from this study; this further buttresses the findings by Mbuilateye et al. in their study on HIV and cancer where they found a decline in the incidence of AIDS-related Kaposi's sarcoma in the United States by 20% over a 10-year period following the introduction of HAART in the management of HIV-infected patients. This study was a comparative cross-sectional study; hence, patients that participated in this study were assessed only once for skin morbidities. Studying them for longer periods would have been better as more cutaneous disorders may have been observed. Furthermore, patients who were failing HAART among the HAART-experienced group were not considered in patient selection which would have been better. Inflammatory dermatoses and skin malignancies were more common in HAART-naive HIV-infected patients compared to HAART-experienced patients. HAART may reduce cutaneous morbidity in HIV patients. Grayson W. The HIV-positive skin biopsy. J Clin Pathol 2008;61:802-17. Garg T, Sanke S. Inflammatory dermatoses in human immunodeficiency virus. Indian J AIDS 2017;38:113-20. Crum-Cianflone N, Hullsiek KH, Satter E, Marconi V, Weintrob A, Ganesan A, et al. Cutaneous malignancies among HIV-infected persons. Arch Intern Med 2009;169:1130-8. Fearfield LA, Nelson M, Francis N, Bunker CB. Cutaneous squamous cell carcinoma with zosteriform metastases in a human immunodeficiency virus-infected patient. Br J Dermatol 2000;142:573-4. Ramadhan L, Mwenzi O, Onyango O, Hywei C, Aluoch J. Epidemiology and clinical spectrum of cutaneous diseases manifesting among newly diagnosed HIV seropositive adults in Nakuru country Kenya. Cont J Med Res 2013;7:1-9. Umoru D, Oviawe O, Ibadin M, Onunu A, Esene H. Mucocutaneous manifestation of pediatric human immunodeficiency virus/acquired immunodeficiency syndrome (HIV/AIDS) in relation to degree of immunosuppression: A study of a West African population. Int J Dermatol 2012;51:305-12. Pitche P, Tchangaï-Walla K, Napo-Koura G, Mijiyawa M, Agbere A, Tatagan A, et al. Prevalence of skin manifestations in AIDS patients in the Lome-Tokoin university hospital (Togo). Sante 1995;5:349-52. Puttaiah K, Sunith V. A hospital based cross sectional study of mucocutaneous manifestation in the infected. Int J Col Res Public Health 2010;3:1. Bonita R, Beaglehole R. Basic Epidemiology. 2nd ed., Vol. 4. Geneva: World Health Organization; 2006. p. 81. DermNet NZ's. Dermoscopy of Other Non-Melanocytic Lesions. Available from: http://www.dermnetnz.org/news.html. [Last accessed on 2013 Oct 31]. Cheng ST, Ke CL, Lee CH, Wu CS, Chen GS, Hu SC, et al. Rainbow pattern in Kaposi's sarcoma under polarized dermoscopy: A dermoscopic pathological study. Br J Dermatol 2009;160:801-9. Parkin JM, Eales LJ, Galazka AR, Pinching AJ. Atopic manifestations in the acquired immune deficiency syndrome: Response to recombinant interferon gamma. Br Med J (Clin Res Ed) 1987;294:1185-6. Toback AC, Longley J, Cardullo AC, Doddy U, Romagnoli M, DeLeo VA, et al. Severe chronic photosensitivity in association with acquired immunodeficiency syndrome. J Am Acad Dermatol 1986;15:1056-7. Gillett J. The mosquito: Its life activities and impact on human affairs. In: Gillett J, editor. Mosquitoes. 1st ed. U.S, Garden city, NY: Double Day; 1972. p. 313-48. Simons FE, Peng Z. Skeeter syndrome. J Allergy Clin Immunol 1999;104:705-7. Wichai S, Varuie D, Chasire S, Pornchai C, Nyunt N. Cutaneous morbidity in HIV positive patients. South East Asian J Trop Med Public Health 2001;32:1. Seborrheic Dermatitis. Available from: http://www.cumc.columbia.edu/dept/derm/conditions/sebo. [Last accessed on 2014 Jan 05]. Muhammad B, Eligius L, Mugusi F, Aris E, Chale S, Magao P, et al. The prevalence and pattern of skin diseases in relation to CD4 counts among HIV-infected police officers in Dares Salaam. Trop Doct 2003;33:44-8. Nnoruka EN, Chukwuka JC, Anisuiba B. Correlation of mucocutaneous manifestations of HIV/AIDS infection with CD4 counts and disease progression. Int J Dermatol 2007;46 Suppl 2:14-8. Sivayathorn A, Srihra B, Leesanguankul W. Prevalence of skin disease in patients infected with human immunodeficiency virus in Bangkok, Thailand. Ann Acad Med Singapore 1995;24:528-33. Mbulaiteye SM, Bhatia K, Adebamowo C, Sasco AJ. HIV and cancer in Africa: Mutual collaboration between HIV and cancer programs may provide timely research and public health data. Infect Agent Cancer 2011;6:16. Onunu AN, Okoduwa C, Eze EU, Adeyekun AA, Kubeyinje EP, Schwartz RA, et al. 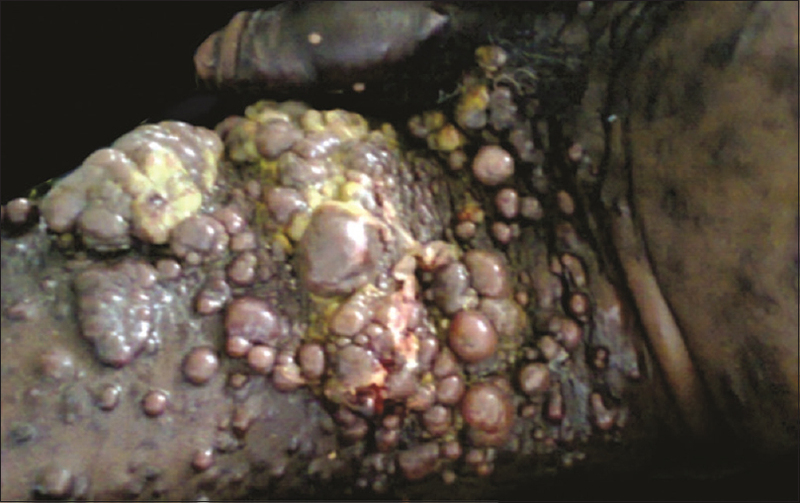 Kaposi's sarcoma in Nigeria. Int J Dermatol 2007;46:264-7. Salami T, Adewuyi G, Echekwube P, Affusim C. Pattern of cutaneous morbidity among a cohort of HIV/AIDS patients accessing care in Rural/Suburban adult ART clinic in Nigeria. Br J Dermatol 2013;3:1199-207. Josephine M, Issac E, George A, Ngole M, Albert SE. Patterns of skin manifestations and their relationships with CD4 counts among HIV/AIDS patients in Cameroon. Int J Dermatol 2006;45:280-4. Wamburu G, Masenga EJ, Moshi EZ, Schmid-Grendelmeier P, Kempf W, Orfanos CE, et al. HIV-associated and non- HIV associated types of Kaposi's sarcoma in an African population in Tanzania. Status of immune suppression and HHV-8 seroprevalence. Eur J Dermatol 2006;16:677-82. Knowles DM, Cesarman E. The Kaposi's sarcoma-associated herpesvirus (human herpesvirus-8) in Kaposi's sarcoma, malignant lymphoma, and other diseases. Ann Oncol 1997;8 Suppl 2:123-9. Mbulaiteye SM, Parkin DM, Rabkin CS. Epidemiology of AIDS-related malignancies an international perspective. Hematol Oncol Clin North Am 2003;17:673-96, v.